Whether it is for personal or professional purpose, the design of vector graphics images requires a specialized and effective program. Xfig can be of a great help for that. 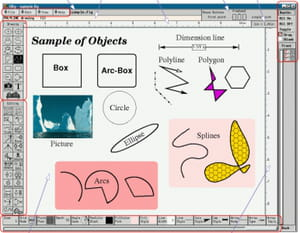 This program provides the user with a drawing panel allowing him to construct basic objects. There, it is possible to design circles, rectangles and even write texts if necessary. Thanks to this option, the user can have access to a wide variety of tools. The latter gives the opportunity to design unique entities for each project. It also includes various types of drawings. With Xfig, each processed and finished project can be viewed in detail at any time. This is possible thanks to zoom module which has been integrated to this program. What characterizes Xfig is that each entity or object created can be stored in the program's database. To do this, the user just needs to save it via the dedicated button. They can be re-used later. This software is also endowed with this feature, which is convenient for transferring files created to other applications. Note that it supports several types of formats, such as PDF, JPEG and EPS. Xfig is an Open Source program. The interface is not available in other languages. Latest update on June 22, 2016 at 04:13 AM.